Princess Eugenie reveals her gorgeous padparadscha sapphire engagement ring. It appears that 2018 is shaping up to be a big year for the Queen of England, with two new great-grandchildren and two upcoming weddings! On the morning of January 22, 2018, love was in the air once again when The Royal Family announced the engagement of Princess Eugenie. The announcement came during a Buckingham photo shoot which featured many close-ups of the stunning ring. After having dated for 7 years, longtime boyfriend Jack Brooksbank proposed in front of a volcano in Nicaragua where they were vacationing. 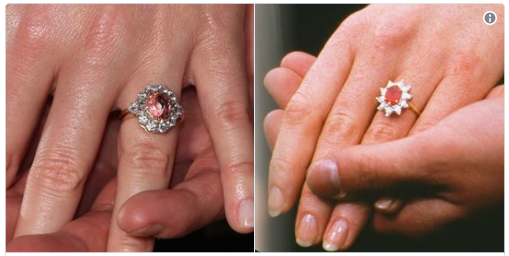 The similar design of Princess Eugenie’s ring (left) and her mother’s (right). The custom-designed diamond ring that Prince Harry used to propose to Meghan Markle. 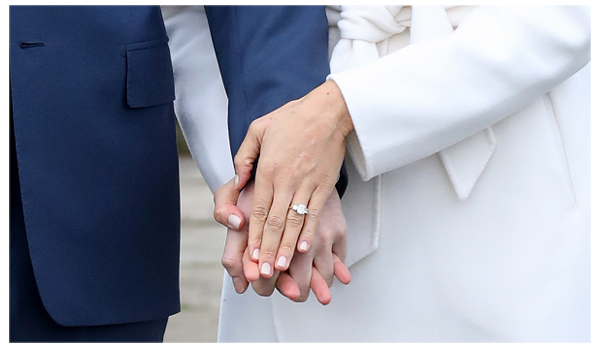 Why is there so much attention surrounding Eugenie’s ring? Let’s take a look: The ring is a gorgeous pinkish-orange Padparadscha sapphire, which is surrounded beautifully by diamonds. If you look closely, it resembles the ring her father, Prince Andrew, gave to her mother, Sarah Ferguson, when he proposed in 1986. 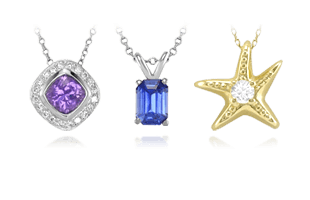 Sapphires seem to be a traditional gemstone choice for the Royal Family. Kate Middleton’s ring, which at one time had been Princess Diana’s ring, is a dark-blue 12-carat sapphire surrounded by diamonds. It is estimated to be worth over $500,000. Prince Harry’s fiance’ Meghan Markle seems to be the only recent bride or bride-to-be that doesn’t bare any sapphires in her engagement ring, instead wearing a custom designed diamond ring (pictured) that Prince Harry created himself. The sapphire looks to be about 11 x 9 mm, or roughly 3-4 carats, surrounded by 10 brilliantly cut diamonds with 2 pear shaped diamonds, helping to give a unique appearance to a classic sapphire ring design. 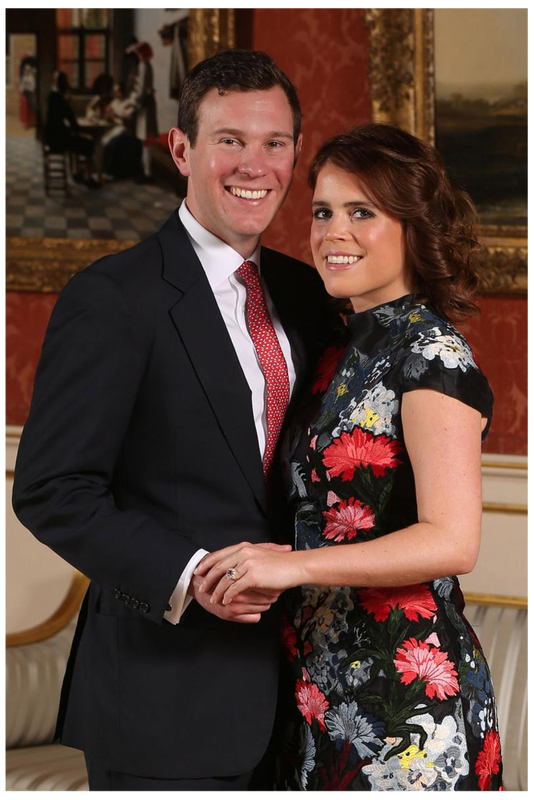 A royal engagement portrait of Brooksbank with his beautiful fiance Princess Eugenie. Padparadscha sapphires are considered to be among the most valuable and beautiful of sapphires. 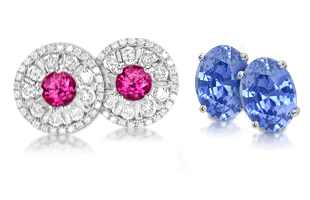 Many in the general public are not familiar with these types of sapphires, but they are treasured greatly by gemstone connoisseurs. Padparadscha comes from the Sanskrit word which means “lotus flower”. When the gemstone was originally discovered in the region of Sri Lanka it was given this name as its hue resembled the area’s peach colored flowers. So how much does this gorgeous ring truly cost? 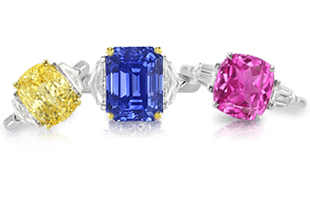 Without looking at the billing statement Brooksbank received when he purchased it, Michael Arnstein, President of the Natural Sapphire Company is estimating it to have a price tag between $35,000 to $55,000 USD in the wholesale market. Other estimates have put the ring’s retail value up over $140,000. So it’s safe to say that Brooksbank spared no expense for his beautiful fiance’. Eugenie announced that she would be marrying Brooksbank later this fall in the Windsor venue, which is where Prince Harry and Meghan Markle are set to wed in May. Prince Harry and Markle’s wedding is said to be the wedding of the year. Many believe that Eugenie’s wedding will be overshadowed by the Prince’s wedding but her engagement ring proves differently. 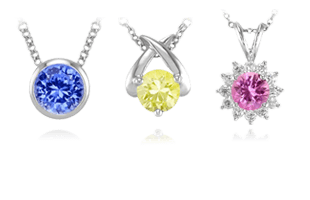 To view our vast inventory of natural padparadscha sapphires and design a custom creation, click here.